IIS 7.0 and above features the ability to plug-in and use custom developed managed modules to accomplish many different tasks and use those modules for all sorts of content. However, the question arises: what happens if the module has problems or difficulties? Previously, you used System.Diagnostics to trace the event when problems occurred. Unfortunately, those traces are completely separate from IIS traces. Not so with IIS 7.0 and above. 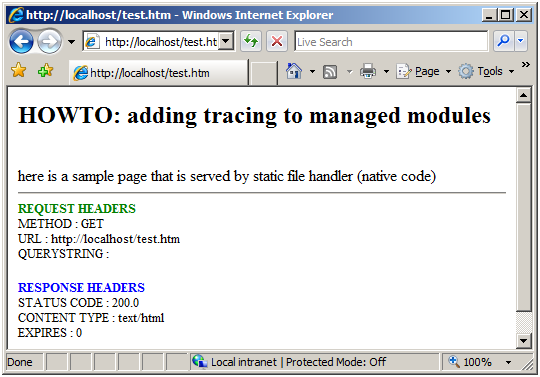 Now you can add traces to the module code using System.Diagnostics.TraceSource (new to .Net 2.0). 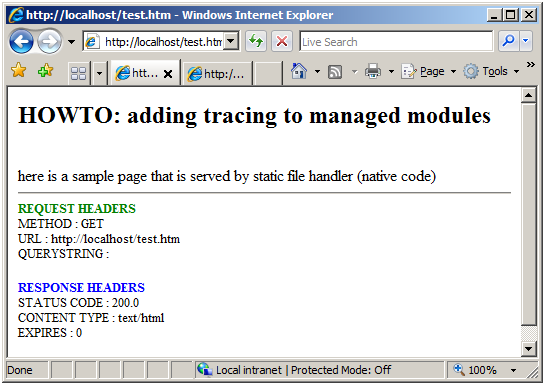 You have the ability to route those traces into the IIS tracing infrastructure so that they are available to modules that consume traces--for example, Failed Request Tracing. Follow the steps below before performing the tasks in this article. Login as is the administrator account or in the Administrators group. Being in the Administrators group does not grant you complete administrator privileges by default. You must run many applications as Administrator. 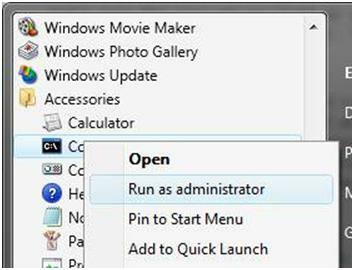 Right-click the application icon and choose "Run as Administrator". Delete everything in the c:\inetpub\wwwroot folder. This is a sample page served by the static file handler (native code). In this section, you create a sample module to instrument. // set cache policy on response so it's not cached. The name of the TraceSource ("tsStatus") is important, as this name is later referenced in the web.config file later. The module is now setup to emit events if needed. Note the use of the /debug & /d:TRACE switches. You must use these switches to compile the trace events into the binary. Failing to compile with these switches means that the module will not have any trace events in it. Having compiled the module, deploy the module and run an initial test to see if the module works before capturing its traces. This section includes adding and testing the module. 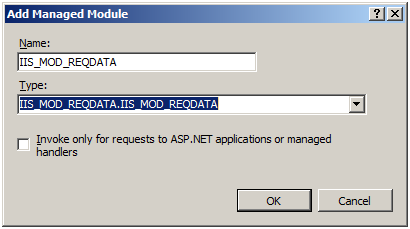 Using the same Administrator command prompt, make a directory called \inetpub\wwwroot\bin, then copy IIS_MOD_REQDATA.dll over to that directory. Enable the module. From the administrator command prompt, type start inetmgr to bring up the IIS administration UI. 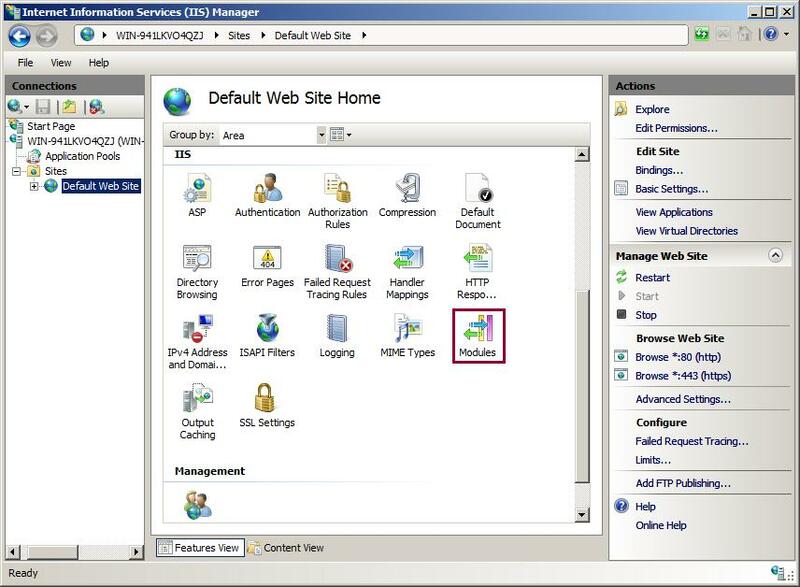 Under the Connections pane, expand the local machine name, then Sites, and click on Default Web Site. Click OK. The newly traced module is now configured for the web site's use. The "REQUEST HEADERS" & "RESPONSE HEADERS" content came from our module, indicating that is works. 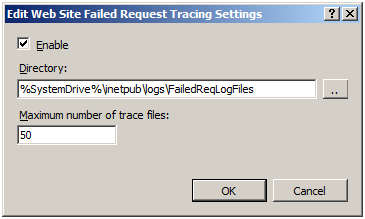 This task hooks the Module's TraceSource up to IIS tracing so that its events are emitted through IIS and then configure Failure Request Tracing to capture these trace events. The module is updated to include trace events. Configure System.Diagnostics and IIS to capture these trace events and route them into IIS's Failed Request Tracing module. Do this by configuring the <system.diagnostics> section in the web.config file to setup the TraceSource & route its events accordingly. Using your Administrator command prompt, navigate to c:\inetpub\wwwroot, and use notepad to edit your web.config file. Defining the trace source, attaching the switch we defined as well as defining the trace listener for our source. 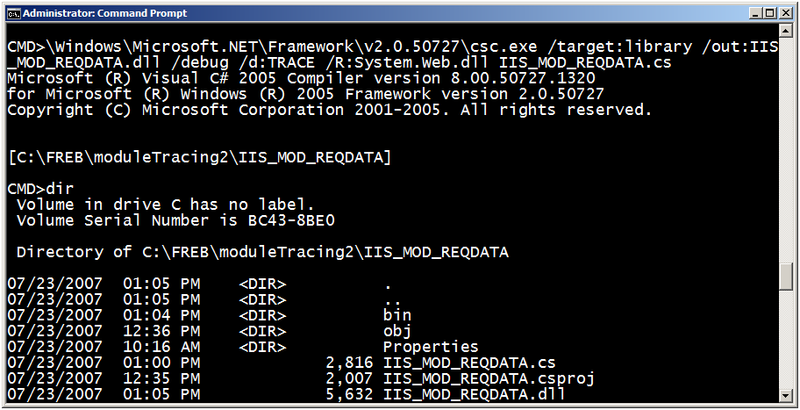 IIS ships a new System.Diagnostics.TraceListener used to route TraceSource events into IIS's Trace infrastructure. This provider must also be defined in your web.config file. Define the traceSource by its name (tsStatus) and wire it up to the DefaultSwitch & IisTraceListener. Copy and paste this <system.Diagnostics> section into your web.config file (after your <system.webServer> section). The tsStatus traceSource is wired up to the IIS7TraceListener, which will emit events into IIS's tracing infrastructure. Continue to the next step to wire those events up to the Failed Request Tracing provider. Check the Enable check box. Keep the defaults for the other settings. Click OK to continue. In the Actions pane, click Add…. 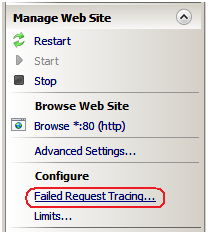 This launches the Add Failed Request Tracing Rule wizard. 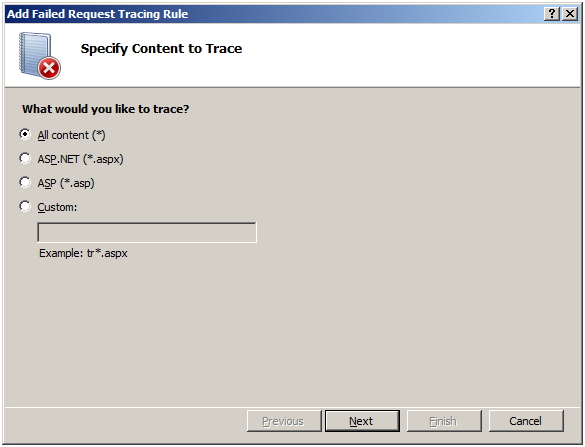 On the Specify Content to Trace page, select the All Content (*) option for what to trace. Click Next. 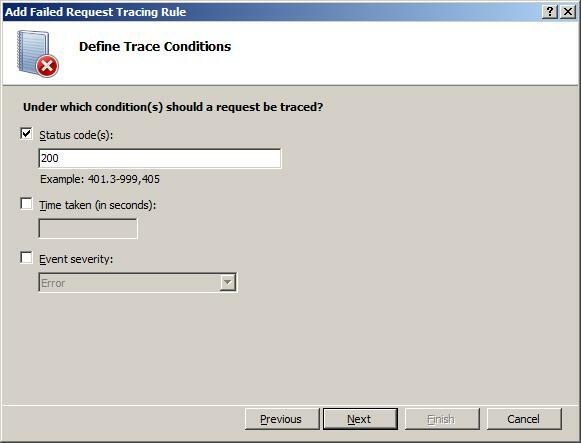 In the Define Trace Conditions screen, check the Status Codes check box & enter "200" as the status code to trace. Click Next. 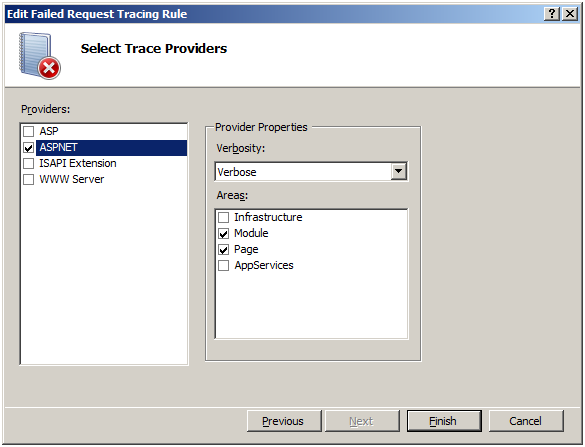 The Select Trace Providers page appears. Select the ASPNET check box and the Module & Page check boxes under "Areas". Under Verbosity, select Verbose. 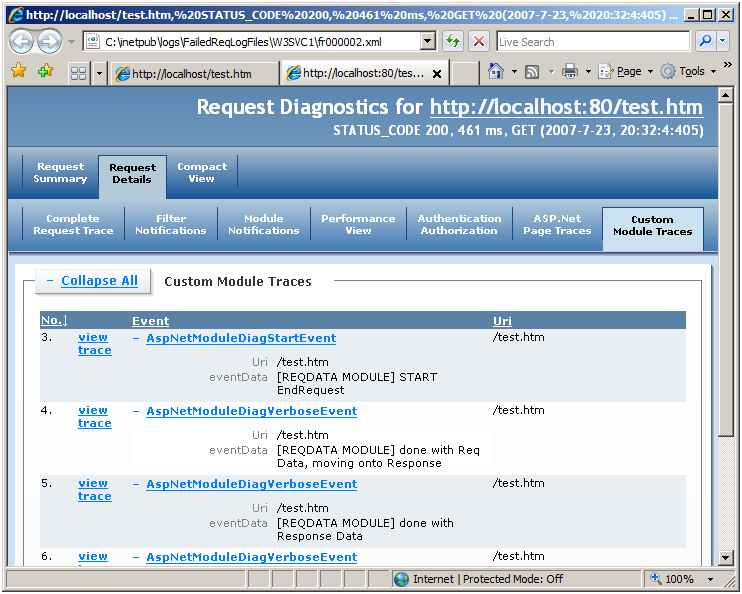 Due to a bug in Server Beta 3 builds, module traces can only be captured if both Module and Page areas are selected. Post Server Beta 3, only Module is required to collect these events. To verify our module has generated traces that have been captured, use an Administrator-elevated Internet Explorer window and hit CTRL-O, then navigate to c:\inetpub\logs\FailedReqLogFiles\W3SVC1. In the dropdown list box that reads HTML Files, select All Files. You finished adding a new trace event to a managed module, compiled and deployed that module, configured System.Diagnostics to route its events to IIS's tracing infrastructure, and finally, configured IIS's Failed Request Tracing feature to capture its events. You can now easily add new events to the module, then recompile the module & deploy it to the \bin directory. Using Failed Request Tracing, you see the results of the events. Remember that using System.Diagnostics.TraceSource allows you to still use your module and its trace events down level, provided you hook it up to a different trace Listener.